The Ettin Mother, like the Grendel Mother with Grendels, is what produces Ettin eggs for the World. Creatures 2 was the first game featuring Ettins. The machine-like Ettin Mother can sense when there are no Ettins left, and will produce a single egg to start over. 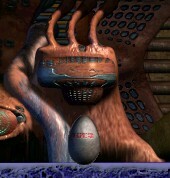 Although it is possible to create a female with the Metamorph Device, the game will hatch only males, and by virtue of the game, all Ettins are infertile. Creatures 3's Ettin Mother is located in the Desert Terrarium, and still bears a strong resemblance to its previous version. Unless interfered with, it will hatch two female Ettins to roam the ship, and will try to keep it that number or above. Males can be created by splicing two females, and they can breed. This page was last modified on 3 April 2018, at 01:44.